Last Saturday, March 16, the “Yellow Vest” demonstrators concluded their 18th week of protests in Paris. 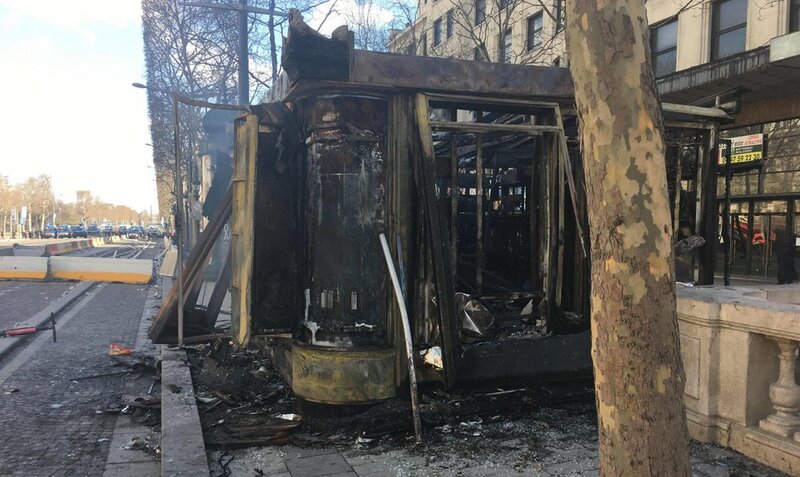 Protestors burned several building fronts, including that of the historic restaurant Fouquet’s (a popular place to dine among celebrities and political officials), vandalized and shattered glass storefronts of Disney, Bulgari, and Hugo Boss, and set several newspaper kiosks on fire. The movement progressed from the Arc de Triomphe down the Champs-Élysées, one of the world’s most renowned streets. French police combatted the protestors with rubber bullets, tear gas, and water cannons. The Yellow Vest protests began in November last year. The protests were originally against a proposed tax increase on gas in order to encourage citizens to purchase fuel-efficient vehicles and hence reduce environmental harm. Gas prices are currently just under $6 per gallon in Paris, nearly two to three times as expensive as fuel in North Carolina. In the 18 weeks of chaos, the scope of the protests has expanded to include issues such as speed limits, environmental issues, and even the resignation of French President Emmanuel Macron — but all seem to stem from the common grievance of the extremely high cost of living in France. The Yellow Vests primarily comprise of the “forgotten middle-class”; those who are too wealthy for government assistance but not wealthy enough to see tangible returns on the tax money they contribute to the government. NBC reports that many in the French middle class, those making between $30,675 and $82,237, are taxed at 30 percent, while in the U.S., an individuals earning $30,675 and $82,237 are taxed at 12 and 22 percent, respectively. The movement, mainly promoted through social media platforms such as Facebook, has lost support with each week it prolongs. At the peak of the protests, the Yellow Vests had over a quarter-million participants. The last weekend of protests saw a resurgence in participants, attracting approximately 10,000 Yellow Vests with approximately 1,500 being labelled as “ultra-violent”. Although the protests were not meant to be violent, organizers have lost control of extremist groups within the Yellow Vests as the scope of conflict has significantly increased. French Prime Minister Édouard Philippe has since stated protests with identifiable “ultra-violent” protestors would be prohibited in the future in areas that have seen the most damage, such as the Champs-Élysées. Philippe also condemned the lack of efficient government response to the protests and implied he would replace the police chief sometime this week. Accompanying this past week’s demonstration was the conclusion of President Macron’s nationwide debates in response to demands for greater political participation among citizens. Macron is expected to enact several other reforms in 2019 such as pension reform and employment benefits, all of which are predicted to cause more uprisings in Paris and around the country.